US Secretary of State Mike Pompeo has called for unity in the Gulf region, as has kicked off his Middle East tour with a stop in Kuwait City for the third US-Kuwait strategic dialogue session. Pompeo will seek to strengthen cooperation on defence, cybersecurity and trade, during his stop in Kuwait, his spokesperson Robert Palladino said. Al Jazeera’s Jamal Elshayyal said the US top diplomat would also focus on creating “a breakthrough in finding a resolution to the GCC crisis” describing Pompeo’s visit to Kuwait as “the most challenging part of his trip”. In June 2017, Saudi Arabia, Bahrain, the United Arab Emirates and Egypt imposed an ongoing land, sea and air blockade on Qatar, accusing Doha of supporting terrorists. Qatar has vehemently denied these claims. “The fact that these countries are not seeing eye to eye is stifling any sort of plans or policies the US wants to implement in the region,” Elshayyal said. US President Donald Trump has initially backed the blockade of Qatar, but “it has since transpired that that was not only detrimental to the US’ interests in the region but more so to the peoples’ interests here in the region and the stability of the GCC,” Elshayyal explained. Kuwait has been at the forefront of trying to find a resolution to this crisis and mediate between the other Arab Gulf countries, which remains in deadlock. Kuwait’s foreign minister said that a long-awaited US peace proposal for the Middle East should factor in regional considerations and all stakeholders. 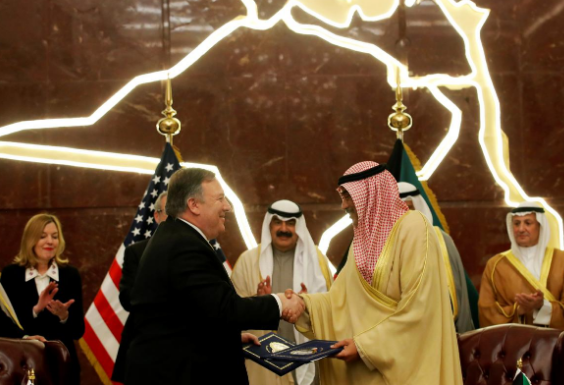 “We hope the plan will take into account the situation in the region and all the relevant parties,” Sheikh Sabah Khaled al-Sabah told a joint press conference with Pompeo. Pompeo took time to pose for photographs with US embassy personnel and their families and met with members of the US Chamber of Commerce, as well as with US and Kuwaiti business leaders. He also met with recent Kuwaiti graduates of US universities and exchange programmes. On the flight from the United States, Pompeo told reporters that he would discuss “strategic dialogue” and the need to combat “the threat posed by the Islamic Republic of Iran” with leaders in the region. After Kuwait Pompeo will fly to Israel where an election campaign is in its final weeks with Prime Minister Benjamin Netanyahu locked in a close battle with centrist rivals. After his stop in Israel, Pompeo will head to Lebanon, where he is expected to focus on Hezbollah’s role in the region.